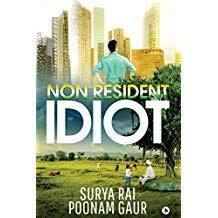 ‘Non Resident Idiot’ – a spellbinding fiction and the combined effort of two thought-provoking storytellers –Surya Rai & Poonam Gaur, writing this true-to-life piece to inspire. Life’s on a roller-coaster ride… full of beans… And, amidst all ups-and-downs – highs-and-lows – and – good-and-bad - joie de vivre ‘Non Resident Idiot’ comes by…. an interesting side of the life of a protagonist, Moujee, a naïve central character on the rise to be an NRI, born to make an impact. His high spirited inspiring life lived with purpose, from a young age, gets recognised in a high voltage campaign for a prestige title, wherein, he is spotted alongside and pitched against the tallest of industrialists. Contemporarily, set into modern-day India whilst each and every episode picturises the paradoxes of rural and urban India, in-keeping the Reader engrossed by-as the exciting events narrated graphically. Interestingly, Moujee, a daring boy from his far-flung village in Eastern Uttar Pradesh lives through an exciting journey of his early childhood, eventful Campus life full of twists till he becomes an NRI in pursuit of a legacy. His ex-girlfriend, takes on all influential TV Media, pitching him as commoner against the mighty industrialists to a campaign for a celebrated title. His life is full of inspiration, conflicts, dilemmas as he stands up for honesty, friendship, loyalty and Purpose. The captivating and vivid journey of the protagonist is at the intersection of Inspiration, Youth, Friendship and Romance. All-in-all, the storyline appeals to all Indians Residents and Non Residents, as it sketches the passage-way of a simple village boy to become an NRI with impact inspiring millions. In simple words, “inspirations fulfil aspirations”. And, a good ‘Write’ always heightens and draws a good ‘Read”? Surya Rai is an XLRI alumnus and a senior executive with a U.S. MNC and his passion for transforming India is intensely reflected in this work. He has used his experiences effectively to provide readers with a realistic and good mix of contemporary and diverse characters with life-changing events.